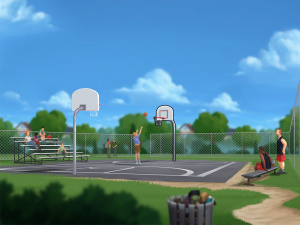 Across the street from the school is the basketball court where Dexter usually hangs out in the afternoon. Missy and Becca made this place their home. Basketball minigame can be played here after being unlocked in Roxxy's route (click on the basketball hoop).